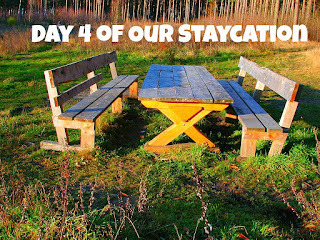 Day 4 of our Staycation was a little bit back to the usual but in a good way. We did get to sleep in until about 9:30 am. Both of us were really tired from the beach yesterday. I think being out in sun all day zapped our energy. Well we both got up and lazed about the house all morning then we got dressed and headed to our first destination, my company picnic. We had a blast (not sure why but I like this word a lot but you probably noticed that already). I love my company so much. I work for a large entertainment company and this year is a huge milestone anniversary so they went over and above with the decorations, food, drinks, snacks, prizes, door prizes, games and entertainment. I would share pictures but I sort of want to keep that part of my life private which is the reason I'm not sharing the name but if you friend me on social media you'll find out easily. Then after the picnic we decided to go "thrift-ing" or "antique-ing" as I like to call it. My husband really enjoys video games. Okay that's an understatement he absolutely loves them and recently he's been asking if we could go to garage sales, GoodWill or other thrift stores to find old Nintendo game consoles and games. It was so cute. He was so excited about finding a particular system that he wanted to go look for a garage sale on a weekday in the afternoon in our neighborhood. I'm like, "Honey slow down it's probably best if we wait for the weekend. Plus who has a garage sale on a weekday in the afternoon?". Yup that's my hubby but I love him. We spent most of our afternoon looking for old games. We went to 2 GoodWill stores, a thrift outlet and a local video game shop called Game Dude. Although we didn't find anything we had so much fun just looking at all the random stuff that ends up at the GoodWill and thrift stores. It's amazing what people will give away these days. We also found some really cool retro games at Game Dude that brought back old memories. If you're a game lover and live in the LA area you should check out Game Dude they have new and used games and game systems. They have everything. Then we were bad stopped by our favorite bakery, Buttercelli, that has delicious gluten free and vegan items. I'm actually about to indulge in my vegan vanilla cupcake right after this post goes up and my hubby will be enjoying his cranberry loaf cake. Yum! (Don't knock it until you try it.) Now we're home about to snuggle up and watch a movie. I will say that I sort of feel like I had another honeymoon. The last few days have been so peaceful, relaxing and romantic. We both feel refreshed and really happy. Man love is so awesome. Alright I'll save you guys from the mush today. Let me know in the comments if you guys want to see a post where I breakdown how much this staycation cost in total. We did spend some money but not nearly as much as we would have if we went to Santa Barbara like we were originally planning to do. Thanks so much for all your support on my journey to be debt free by May 2018 and as always thanks for reading!